The original Coppergate helm was recovered during excavations in the ancient walled city of York in 1982. Dating from the 8th century, this Anglo-Saxon masterpiece is of great archeological importance. The inscription on the crest is an invocation for protection from the helmet’s owner (a V.I.P. named Oshere) to the Holy Trinity. This reconstruction clearly illustrates the skill of both the 8th century armorers and of 21st century craftsmen. 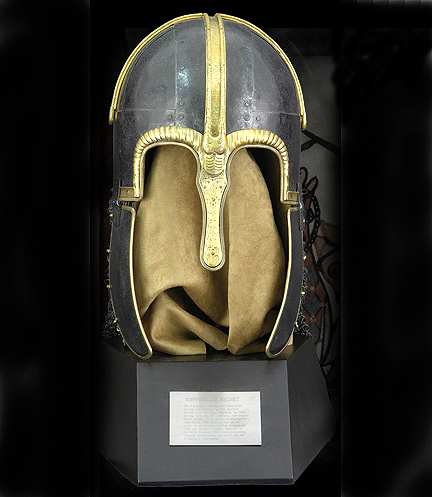 Antiqued stainless steel helmet with brass trim, cloth liner and attached padded cheek guards, maille drape, and display stand. This reproduction is museum quality. Also available is a Coppergate helm - combat grade.